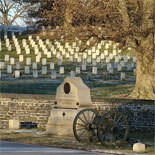 Gettysburg was a serene hamlet in southern Pennsylvania until two armies clashed in and around the town in July 1863. When visiting this historic location, consider these top 10 family friendly attractions. A two-hour excursion that takes passengers back in time. The scenic vista includes wisteria and towering oak trees. You will visit well-known locations, such as Little Round Top a nd Devil’s Den. Your knowledgeable guide provides insights into this epic battle and the legendary figures who led the opposing forces. The museum opens on the sesquicentennial anniversary of the battle. Visitors will understand the crucial role that the terrain played as a Confederate staging area. Exhibits focus on the civilians caught in maelstrom and the care of the wounded. The museum also presents the role of religion and freedom in the war. The home where Abraham Lincoln stayed on the eve of his famous address. Open to the public, there are exhibits about the town, the effects of the battle and the post-war recovery. Two rooms furnished with period pieces include Mr. Willis’ law office and the bedroom where Lincoln slept. Dedicated to the role that civilians played during this historic confrontation. The home has been is restored to reflect its 1860s appearance. Inside are several displays of Civil War artifacts, such as Union bullets and glass syringes. Costumed guides conduct the tour of all four floors of the home. A scale model depicting the most lethal battle on American soil. Encompassing more than 800-square feet, the diorama is the largest of its kind in the United States. There are over 20,000 hand-painted figures. Light and sound enhance the realism of the show. Interact with more than 300 life-size figures. The museum’s dioramas and displays depict over 35 scenes from the period. The centerpiece of the museum is the Battleroom Auditorium where guests experience a life-sized, multimedia re-creation of the battle. An animatronic figure of Lincoln delivers the Gettysburg Address. An award-winning scavenger hunt will send your family searching along the city streets, deciphering cryptic clues and dodging FBI agents in pursuit of a hidden cache of gold. Costumed cast members make the hunt more exciting. Families will enjoy the hunt for the clues hiding in plain sight. A 100-acre farm and venue for various performing animal shows. Children can get up-close and interact with the namesake miniature ponies as well as other farm animals. The farm has educational displays and special events. The home and farm where the former president retired after the Second World War. He also used it as a retreat and meeting place for world leaders. The working farm and furnished home has exhibits about the president’s wartime experiences. Children will learn how the Secret Service protected the president. Displays the techniques used to grow, harvest, pack and ship these delicious fruits. Highlights of the guided tours include an early apple press, widow maker ladders, honeybee display and other historic equipment. The 1880s era kitchen has period furnishings, including a wood stove.